Accessing access logs for your site can tell you which pages of the site are being accessed and error logs can tell you if there were any errors or warnings raised within the site. 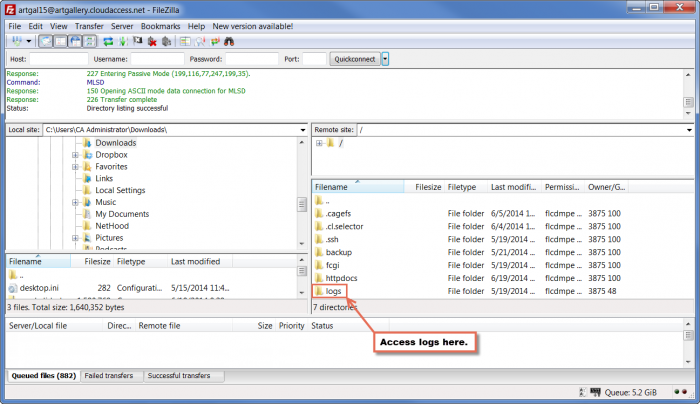 This article illustrates how to enable both logs to be taken and how to access the logs once they are created. 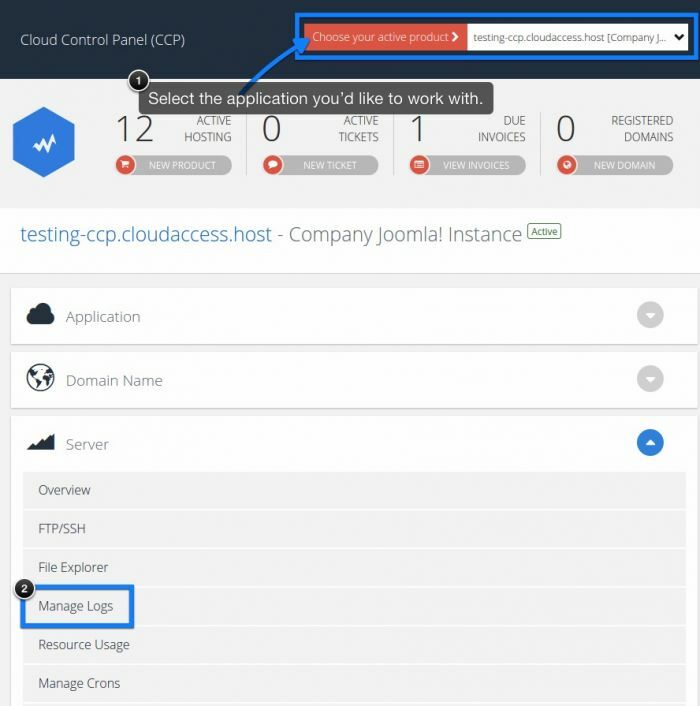 First, you will have to log into your CloudAccess.net Cloud Control Panel™(CCP) to enable the logs. At the top of the CCP, select the site you'd like to work with or locate the site in the "Your Products" list. Once you're in the area to manage that specific application, click on the "Server" options and then select "Manage Logs". 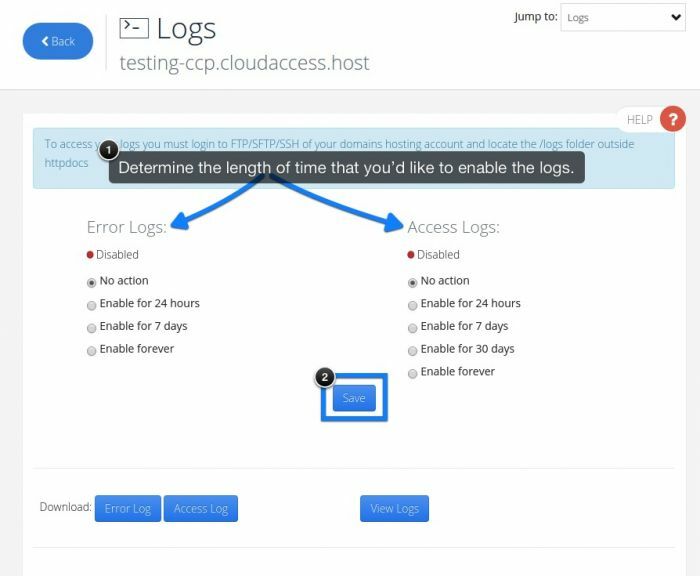 Inside the "Logs" area, you have various options for enabling error logs and access logs for different periods of time. Select how often you would like logs to be created, and click on the "Save" button. After clicking save, you will receive a message letting you know that you have successfully activated the logs. To access the access & error logs, you will have to access your site using FTP, SFTP, or SSH. Learn how to access your FTP/SFTP/SSH login credentials. Learn how to access your site using FTP. Once you have accessed the site using FTP, locate the logs folder and open it. 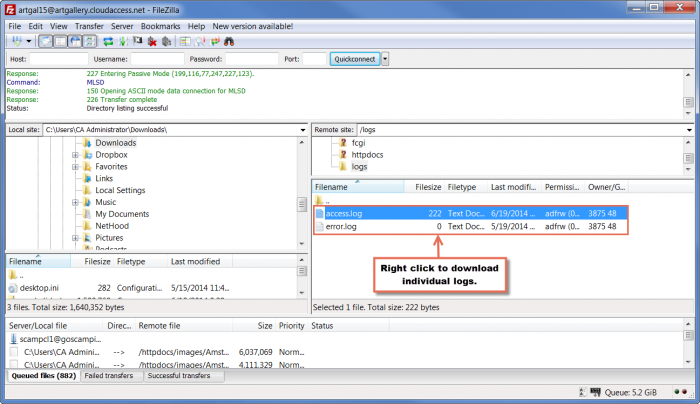 Download the log to your computer so you can view log details. Why would I want to enable logs? The access logs may need to be reviewed, for example, if you're suspicious about somebody trying to hack or otherwise compromise your website - once you enable them, you will be able to track which IP address tried to access what portion of the site. If you see, say, a lot of spam registrations, you can enable the access logs to see what IP address are they coming from and block that IP address by, for example, denying access from it via .htaccess. If you're not sure how to do that, submit a ticket and we'll be more than happy to help you. What are the possible downsides to doing so? The only possible downside to enabling logs is that, if left unchecked for an extended period of time, they may take much disc space and will need to be purged to free up that disc space. What do the options mean, and why would choose any but "all the time"? The options are basically just periods of time during which you want those logs to be enabled. Which one you choose is totally up to your own preference. I would be careful with using the "All the time" option, though - as mentioned earlier, the log files may end up taking up a lot of disc space if left unchecked over an extended period of time.